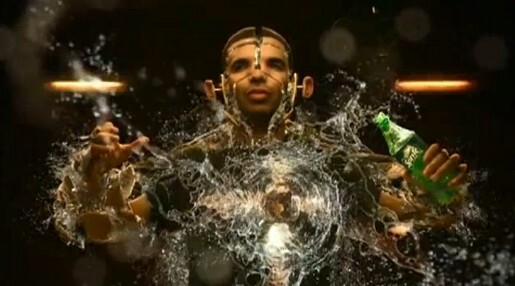 Drake, Toronto, rapper, actor and recording artist, features in Sprite’s latest cinema and television advertising campaign, “Unleashed”, in which he records his track, “Forever”. Looking for inspiration in the studio Drake opens a bottle of Sprite. His body appears to come apart, piece by piece, to allow for refreshment and rehydration, before being reassembled. “Forever” is Drake’s single recorded in collaboration with Kanye West, Lil Wayne and Eminem and released as a single from the soundtrack to LeBron James’s More Than a Game documentary. The ad also features Drake’s real life long-time collaborators: producers 40 and Boy Wonder. The “Spark” campaign is an integrated marketing effort that includes TV, digital, out-of-home and mobile applications. “Spark” will consist of two stages, one focused on music and a second on film. The film campaign will be comprised of innovative commercials featuring Drake as well as film director Rik Cordero and China-based singer/songwriter Jay Chou. The Sprite “Spark” Music Project, an online interactive music mixer that enables people to make their own tunes and/or remix music from Drake with music from emerging artists around the world, which is launching in March; and the Sprite “Spark” Film Project, due to launch in April, will provide people with the tools and content to edit their own 45-second animated films. “Unleashed” will run in four markets, Phillipines, Turkey, South Africa and the U.S.A., where it debuted during the pre-Super Bowl broadcast. The Spark campaign was developed at BBH New York by creative directors Kevin Roddy and Amee Shah, art director Erik Holmdahl, copywriter Beth Ryan, account executive Kelly Donahue, account director Ty Kenig, planner Bryan Smith, agency producer Jen Moore. Filming was shot by director Ben Steiger Levine via A White Label Product with director of photography Chris Soos, executive producers Ellen Jacobson-Clarke, Annique Decaestecker, line producer Lynn Zekanis. Editor was Steve Gandolfi at Cut & Run, New York, with executive producer Angie Aguilera, producer Beth Fitzpatrick. VFX were produced at MassMarket by lead Flame artists Nick Tanner, executive producer Rich Rama, SFX/Post supervisor Aleen Kim, and many more. Music was produced at Squeak E Clean Productions, Los Angeles, with executive producer Zach Sinick. Sound was mixed at Sound Lounge, New York.